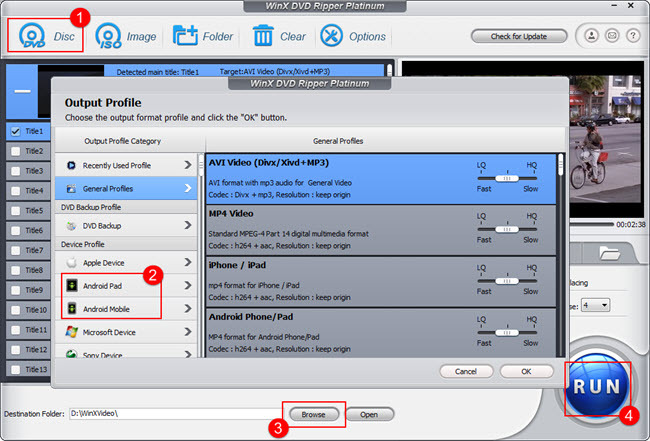 WinX DVD Ripper Platinum, full-featured DVD to Android ripper, can fast convert DVD to Android (8.0 or lower) devices. Google has released its latest Android OS - Android 8.0 Oreo in August. If you'd like to watch DVD movie on the Android 8.0 or other Android phones, this guide will do you a favor on how to convert DVD to Android. It is generally known that DVD contributes largely to home entertainment with its remarkable picture quality and sound. So, DVD is desirable to consumers especially those who are movie buffs. In the meantime, smart phones and tablets running Android gain quite high market share, like Samsung Galaxy Tab/Note, HTC, Sony Xperia and so forth. They are excellent choices for watching movies on the go. However, Android phones and tablets can not play DVD movies directly without a DVD-ROM though Android accepts various video formats, such as AVI, MPEG4, H.264. Thus, it's necessary to rip DVD to Android and play DVD on Android tablets and phones. That is to say, DVD should be ripped to other video formats that are compatible with Android. 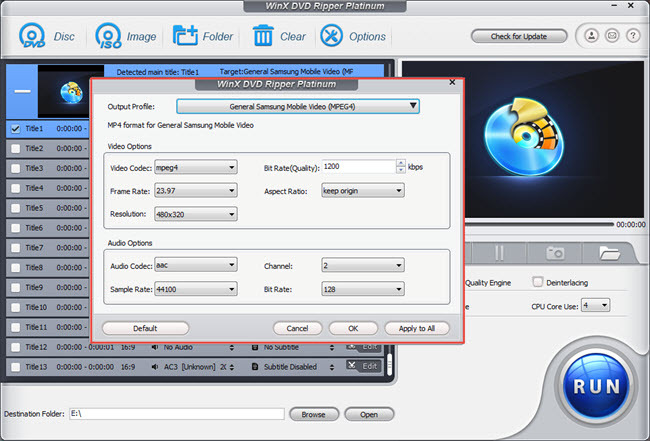 WinX DVD Ripper Platinum helps convert any DVD, even the latest encrypted DVD to Android phones and tablets after removing copy protection from DVD at much faster speed and much better quality with the help of Multi-core CPU (up to 8), Hardware Acceleration, High Quality Engine and De-interlacing Engine. What's more, it gives you a chance to not only adjust parameters to optimize video quality, but also to add ideal subtitles, get duration and aspect ratio you want and cut off unwanted area or trim any segment. Also, it offers you the option to grab screenshot from which you are able to choose to set a wallpaper for your Android phones. Step 1: Download WinX DVD to Android converter. Load DVD by clicking "DVD Disc" icon and select the source DVD disc. Step 2: Select the needed output format from the pop-up Output Profile window, like Android Mobile or Android Pad as you wish, click "OK". At the same time, parameters are adjustable for users to set bit rate, frame rate, resolution, aspect ratio, etc. Step 4: Click "RUN" button to start DVD to Android conversion. Apart from ripping DVD to Android, it is capable of ripping DVD to any other video formats (MP4, AVI, MOV, WMV, MPEG etc.) and DVD to iPhone X/8/7/6s/Plus, iPad Air 2/mini 4/Pro and other Apple devices. Moreover, it provides four DVD backup modes, cloning DVD to ISO image, or to DVD folder, copying full tile or main title to MPEG 2 file with original audio and video kept. In short, with powerful functions and easy operating process, WinX DVD Ripper Platinum offers excellent solution to convert DVD to Android. Watching DVD on Android 8.0 or other Android phones or tablets can be achieved easily and perfectly.